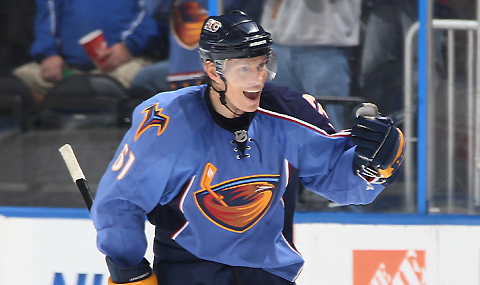 Maxim Afinogenov, a 10 year veteran of the NHL who registed 395 points with the Buffalo Sabres and Atlanta Thrashers, has signed a 5 year deal with SKA St. Petersburg of the KHL. Afinogenov was offered the contract a few weeks ago and just like fellow Russians, tried to use that contract as a bargaining chip to get more money to play in the NHL. No figures of the deal were released but no NHL team wanted to match or beat it. He decided to take the money to leave the United States and go back home to Russia. But, he isn’t the first player to do this. A large list highlighted by Evgeni Nabokov, Denis Grebeshkov, Ray Emery, John Grahme, and future NHL Hall of Famer Jaromir Jagr. Ilya Kovalchuk was rumored to be interested in going to the KHL earlier this summer. But, how far will this go? The KHL offers larger average contracts that are tax-free at a level a few steps below the NHL pace. A lot of Russians are eager to return to their home country to make more money. Now, the players are going too far, using the KHL contracts as a bargaining chip to try to get more money from NHL teams. If they don’t like what they are offered, they are just walking out of the league. Ottawa Senators GM Brian Murray has said on multiple occasions that he will never sign or draft a Russian born player because of this exact reason. How far will this go? Will the NHL do something about this? Only time will tell..
John Madden has signed a contract with the Minnesota Wild. No terms have been released yet. Chris Chelios is returning to the Detroit Red Wings, but for an undisclosed position, not as a player. Edmonton Oilers signed Martin Gerber to a 1 year deal. There are officially 3 teams in the running for Thomas Kaberle and have put legit offers on the table. Brian Burke wants a top-6 foward and it seems like he is going to get that. Sources say that Burke will make two deals: one with Kaberle and one using newly acquired players for the second. A deal will get done, but don’t expect it until the 15th. The Bruins are trying to shop Michael Ryder. As of today, they are $3M over the cap limit and getting rid of Ryder’s contract would certainly help out their situation even though they would be losing a gifted scorer. The Nashville Predators are very interested in acquiring Patrick O’Sullivan. Willie Mitchell has stated the only three teams he is willing to sign with: Vancouver, Washington, San Jose. He would fit in well for all three teams but I see him resigning with Vancouver. This entry was posted in News, Trades, & Signings, Rumors and tagged Afinogenov, Brian Burke, Brian Murray, Chris Chelios, Detroit Red Wings, Gerber, John Madden, Kaberle, KHL, Michael Ryder, NHL, Oilers, Patrick O'Sullivan, Predators, Russians, Wild, Willie Mitchell. Bookmark the permalink.